1890 ½d Brown Stationery Post Card cancelled with the Penny Postage Jubilee star cancellation showing on the reverse a superb "BA/E" cachet struck in the Army Field Tent at the event. 1886 5d Dull Green, SG 193, A-F and 1d Lilac, SG 172, tied to envelope addressed to SINGAPORE STRAITS SETTLEMENTS by a fine VENTNOR 971 duplex. 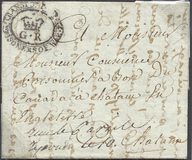 1801 Napoleonic War period Cover from Quebec "Pr The Nancy/Capt Baine" and addressed to Greenock showing on the front a very fine oval-framed SHIP LETTER/. crown ./QUEBEC and SHIP LRE/. crown ./LIVERPOOL on arrival, Robs S4, both in black. ATTRACTIVE. 1805 SOLDIERS LETTER from EDINBURGH to CULLEN endorsed "WM GRANT COL 10TH MILITIA" and rated 'Pd 1" and scroll "POST/PAID' in RED.